A player will no longer need to kick to himself to play on out of the goal square. In addition, the man on the mark will be moved back to 10m from the top of the square (was 5m). Essentially, the goal square is a “safe zone” that the player bringing the ball into play can stand until the umpire calls them to play on or they step outside. Almost like a made up game in high school PE. Since this was announced, it has been thought that most players will elect to take their disposal outside of the square. Not only to gain a few extra metres for the longer kicks, as the AFL is hoping with the changes, but because there is minimal danger for them. The man on the mark is now back another 5 metres and you’d think there will be plenty of space for them to move around after a behind. Champion Data released this statement via Twitter this afternoon. As per previous seasons, there will be no disposal given when a player kicks-in while clearly still in the square, even after the umpire has called “play on”. Once the player steps completely out of the square before kicking-in, this will count as a disposal, similar to past seasons after a kick-in to self. All handballs will be counted as disposals regardless of where the player is standing. Simply, every player who is taking the kick-in, is likely to see a boost in their numbers this year as these are just bonus points – even if they don’t always take it from outside the square, they are as hell are going to do it more time than they did before as they don’t have to kick to themselves now! So which players are worth a look in Fantasy? This article was released ahead of round 23 last year, using data from the first 22 rounds. While not complete, it gives us a bit of a picture of who are the likely candidates for extra points. Click here for the AFL.com.au article released today that shows the top 10 players who take kick-ins and their percentage kicks to self. Here’s a summary of each club from a Fantasy perspective using the data from the first 22 rounds. I’m going to use a conservative figure of 75% of kick-ins will be taken from outside of the square (I honestly think it will be about 90% of the time, but you know, be conservative… we can’t get too excited/greedy). 2018 kick-in specialists: Luke Brown (93 – 39% of all kick-ins), David Mackay (27), Wayne Milera (25), Rory Laird (18). The Crows played on 21% of the time, usually by players other than Brown (16%). Rory Laird was on the end of the most marks from kick-ins (18). Brodie Smith is likely to be taking some of the kick-in duties this year. Wayne Milera has said that he will be playing in the backline as he did last year, so he is definitely one to watch for extra kick-ins. 2018 kick-in specialists: Alex Witherden (126 – 51%), Daniel Rich (51), Luke Hodge (42), Tom Cutler (8). Witherden is definitely their number one guy taking more than half of the kick-ins. He elected to kick to himself 41% of the time, higher than the club’s 29%. Witho would see a bump of 6-9 points based on last years numbers, pushing his average from the mid-high 90s. It’ll be interesting to see if he remains the go-to guy, but reading Roy’s Deck of DT, it sounds like he wants to be! 2018 kick-in specialists: Kade Simpson (95 – 37%), Lachie Plowman (54), Jed Lamb (33), Dale Thomas (32). Sam Docherty was probably going to be the man to take the kick-ins as he has taken the most for the Blues while he was playing, but with him injured, it might be Simpson again. The veteran kicked to himself 43% of the time, up on the Blues’ team 30%. During the JLT, keep an eye on what Nic Newman’s role could be regarding kick-ins. 2018 kick-in specialists: Lyndon Dunn (59 – 33%), Jeremy Howe (46), Brayden Maynard (20), Sam Murray (12). Dunn is out with an ACL, so the Pies will probably see Howe as the designated kicker. As a club they played on a mid-range 22% of the time. 2018 kick-in specialists: Conor McKenna (77 – 32%), Brendon Goddard (61), Michael Hurley (52), Adam Saad (18). With Goddard retired and the thought that the runners may take the kick-ins, McKenna and Saad could find that their primary role after a behind. McKenna played on around half of the times he had kick-in duties. The Dons were the club who looked to play on the most last year. 2018 kick-in specialists: Luke Ryan (107 – 41%), Nathan Wilson (100), Michael Johnson (17), Stephen Hill (7), Shane Kersten (7). This is the big one. As a club, the Dockers only played on 21 times during the season – just 8% – and Nathan Wilson took most of those with 17. He’ll provide dash and could see his numbers jump up, but it’s Luke Ryan who could be the big benefactor. He took the fourth most kick-ins last season in the competition and kicked to himself just once. There’s potentially 15 points he could add to his 77 average from this year putting him right in the mix as D2 in Draft leagues and knocking on the door of a 90 average. Luke Ryan could gain a significant boost in points in 2019. 2018 kick-in specialists: Zach Tuohy (85 – 35%), Tom Stewart (73), Cam Guthrie (32), Mitch Duncan (21). Tuohy and Stewart shared the kick-in duties with Stewart playing on to himself 58% of the time (team was 31%). With upside thanks to this and another year in the system, Stewart could find himself in the mid-to-high 80s if he had more responsibility in 2019, while Tuohy could burst the 90+ barrier for the first time of his career. Interesting to see Duncan took the fourth most kick-ins. 2018 kick-in specialists: Steven May (90 – 30%), Jarrod Harbrow (74), Jesse Joyce (22), Michael Rischitelli (19). With May now at the Dees, could we see Harbrow take a truckload of these? Does Sam Collins get a look in? This will be where we may see the most significant change. As a club they played on 25% of the time last year with Harbrow electing to play on a third of the time he took the kick. As we know, the Suns will be scored on a truckload and there will be plenty of kick-ins to be had by whoever gets the nod. 2018 kick-in specialists: Heath Shaw (84 – 40%), Jeremy Finlayson (57), Lachie Whitfield (51), Aidan Corr (12). We all know Heater kicks to himself out of full-back and knows that he should be doing it too! He plays on 57% of the time and as a club, they like to do it, going at 38%. While his bump may not be as big as others due to how much he likes to go to himself, we could see Shaw head back over 90 and maybe up towards 2016’s 102 average. Need to see whether Zac Williams’ return could see him get his hands on it from the goal square given his ability to run. 2018 kick-in specialists: James Sicily (64 – 31%), Ryan Burton (57), Blake Hardwicke (40), Taylor Duryea (12). The SicDawg could be the man with Burton (and Duryea) at other clubs. Burton took over from Sicily at the end of the season when he was out injured. The Hawks had the second fewest kick-ins to self behind the Dockers, so if Sicily has the role, then look at him to increase by 10+ points to be in the mix for No. 1 defender! Wowee. It isn’t unreasonable to think that he could go to 110. Is James Sicily heading towards uber-premium status? 2018 kick-in specialists: Jordan Lewis (69 – 34%), Bernie Vince (55). Christian Salem (41), Michael Hibberd (13), Jake Lever (13). Lewis could be in his last season, but was used a fair bit (and Vince is done). The inclusion of Steven May, the Suns’ leading kick-in player, could see him have the responsibility for the Demons. Hibberd could see some bigger numbers after a poor Fantasy season if he gets the job again. 2018 kick-in specialists: Scott Thompson (75 – 34%), Jamie Macmillan (69), Robbie Tarrant (32), Marley Williams (18). You’d think the kick-ins may suit Macmillan, who took just under a third of the kick ins and played on 29% of the time (team was 17%). Definitely one to watch in Draft. 2018 kick-in specialists: Dan Houston (74 – 38%), Riley Bonner (66), Jasper Pitard (18), Tom Clurey (11). Ryan Burton got amongst it for the Hawks, so he may pick up some of the duties here. As a club the Power played on 25% of the time with Houston kicking to himself a third of the time. 2018 kick-in specialists: Jayden Short (90 – 54%), Nick Vlastuin (24), Brandon Ellis (23), Bachar Houli (17). It’s pretty clear that the Tigers like the ball in Short’s hands. He took more than half of the kick-ins and kicked to himself less than 20% of the time. Richmond had the fewest kick-ins recorded last season, but there has to be another gear for Short who increased his numbers by almost 20 points from the season prior. A fit Houli may find it part of his role and who knows where Ellis stands these days. It’s all about Short and may even find himself a 90 averaging defender as he runs the ball out of the square for those kick-ins. Jayden Short could be a Draft smokey. 2018 kick-in specialists: Shane Savage (71 – 29%), Jimmy Webster (55), Bailey Rice (21), Seb Ross (16). Savage has averaged 81 the last two years and could see a decent bump given he rarely kicks to himself. Webster played on nine times of his 55 kick-ins as he shared duties with Savage. Webster missed five games. Dylan Roberton looks likely to return to the side after missing most of last year with a heart issue and could see a spike. 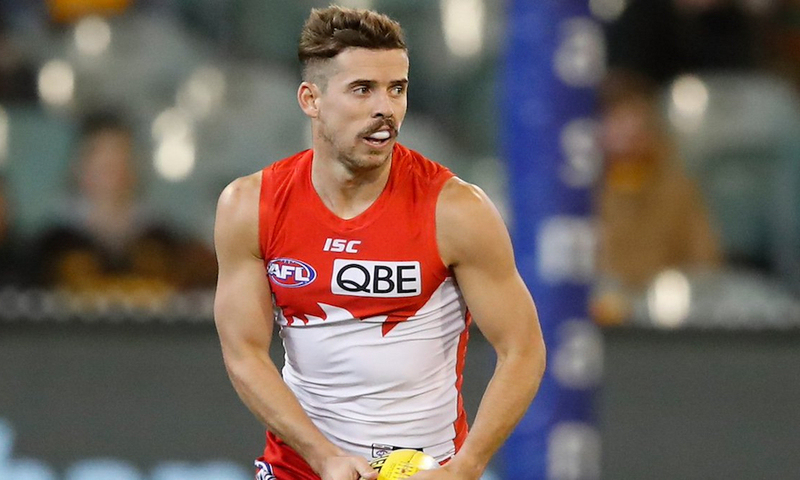 2018 kick-in specialists: Jake Lloyd (147 – 56%), Jarrad McVeigh (77), Zac Jones (17), Dane Rampe (8). Lloyd seems to always goes short and often gets it back, which could counteract the bonus points he may receive. He played on to himself in around 30% of games, while as a club, the Swans played on 26% of the time. Lloyd is already a premium defender and the extra points he may receive could put him right up there, but he will be a massive watch as to how clubs go about it. If the shorter kick isn’t there as much, could Lloyd’s value diminish a little? Personally, he’s my D1. 2018 kick-in specialists: Shannon Hurn (124 – 62%), Lewis Jetta (58), Brad Sheppard (7), Liam Duggan (4), Jackson Nelson (4). Captain Hurn pulls rank and takes the majority of kick-ins and boosted his numbers this year to a career high 89 average. Could this go up again in 2019? Possibly. He played on 41% of the time so there is still a bit of room for improvement, possibly taking his average up by around 10 points. Jetta could see more of it if they elect to get his fast legs in there. 2018 kick-in specialists: Jason Johannisen (52 – 23%), Bailey Williams (41), Matthew Suckling (34), Brad Lynch (24). Bulldogs rank third in the league for playing on (38%) and Bailey Williams did it more than half the times he had the job. They looked to go long more times than most other clubs as their short effective kicks were ranked 18th in the comp. I’ve been told that there will be a feature on this in the AFL Prospectus. You can order that now from http://www.championdata.com.au. Delivery expected early February. Hi Warnie. Is there a place where we can access these stats and data? Sorry if this is a dumb question. Assuming it’s in the afl live pass. Not sure if there are stats anywhere other than the articles I linked to in the above piece. Cheers Warnie for the reply. Will use those stats to base my picks then. Thanks for your time and effort on this article Warnie. This rule will certainly boost scoring for many defenders. Looking forward to seeing how it pans out. Brodie Smith will be taking the kick-ins, so I just don’t see the upside. One of my starting squad strategies is to find players with upside, and a lot of defenders will have that – more so than Laird. Coupled with the fact he is on the end of the short kick out of defence, which may decrease a bit. The concern here is the 75% for me. the range of outcomes for me in this could be a 10% – 90% increases. which at 10% gives only minor bumps. 75% doesn’t seem conservative at all. Do you have anything backing up the 75% or just gut feel? No doubt the AFL ran their numbers on this and may have let you in on those in which case, Lloyd, Wilson and Sicliy all get massive bumps. I agree, 75% seems high. I have no doubt the new rules will benefit some players, but I don’t think we’ll be seeing 10-15 point jumps like Warnie is suggesting. Absolutley nobody will stay in the square to kick in, u guys are nuts. Its more like 90 /95% outside the square. No numbers from the AFL, just gut feel and a lot of discussions. I think that there will be way more than half of the kick-ins taken from outside of the square. The man on the mark is back another 5m, we’ll see fewer short kicks – and even on the ones that we see, they may still take the kick outside of the square as there isn’t much point to the goal square other than being a ‘safe’ zone. I believe that 75% mark is about where it’s at. If I was being ultra-conservative, 50%…. but you’ve got a range starting as low as 10% – I would find that very hard to believe. The biggest part of all of this discussion is that the numbers are based on last year. So much will change coming into the new season. Not only for personnel, but more importantly, game style. There will be a lot of learnings over the first couple of months. R4 will be in this year. I thought a complete redesign of the site would be a perfect time to implement a change (not following SC, something cooler), but they decided to go ‘safe’ with no change to the game. Fingers crossed for 2020. Haha thanks. I didn’t mean anything by the SC following comment. The game is good and will be again this year, saying that I would be happy with a change to the game. Yeah – I think some expect it to go to the 3 midfielders on the bench. I would prefer to make it like the draft model. That is, a bench of 8 still, but you can select players from any position. All 8 could be midfielders, but you can only select one emergency per position (4 in total), so some would be wasted. Ideally, you would probably have at least one per position, but then it is up to you to work out the spread. Would always come down to which cash cows we have named at the start of the season and who is coming through, but offers more flexibility with what we can do. The other way could be to force one ’emergency’ per position, then have a pool of 4 reserves/bench players of any position that can sub in and out where their position allows. While the 3 midfield bench is definitely better than having 2 rucks on the bench, I believe this is an opportunity for the game to evolve and have some nice consistency with the Draft games.